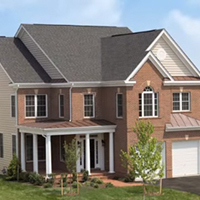 July 6 – Our newest video tour at Moreland Estates in Ashburn, features what you could call our “drama-queen” model, The Laurel. And, we mean that in the most complimentary sort of way. Open the front door of this elegant home with its two story gallery entry foyer and classic turned staircase, and we’re certain you’ll agree. Ready? The nearly 3400 sq., ft. (on two levels) Laurel model makes an elegant and dramatic first impression with its two story gallery entry foyer, classic turned staircase and 10′ high family room ceiling. The open chef’s kitchen with cooktop island and adjacent breakfast room can be further enhanced with the addition of a 162 sq. ft. rear morning room. The upper level of this four bedroom, 3-1/2-4-1/2 bath home features three full baths, including a convenient buddy bath. Take our walk-thru tour and note some of the Carrhomes’ 22 signature features built in to this exquisite model.